This graph shows which NH 4000 Foot Peaks hikers research, before they hike them. I got the idea for this graph from a post at outdoors.org. The AMC counted posts on Instagram, by peak. Their numbers look very different than mine. Lots of Instagram post from Mt Washington and Mt Adams but not much else. My graph is based on page views from my trip planning website for hikers: TrailsNH.com. The page views primarily represent hikers doing research before their next trip. The light green background color is the elevation for the NH 4000 peak, ranging from Mt Washington to Mt Carrigain. 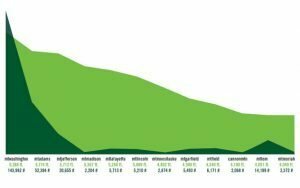 The dark green bumps represent the number of page views of information for that peak. Mtn’s Lafayette & Lincoln (often hiked together) are the clear winners, followed by Mt Moosilauke. That’s very different from what the AMC found. Same as AMC however, Mt Monroe had the least views. I hope to expand the graph in a few ways. First, I’d like to add all 48 peaks. Second, to include a series that showing the counts for trip reports (posts) found by the TrailsNH Bots. That’s more work than I have time for right now. The “views” represent people looking for information, the “posts” will represent availability of information. Washington is very popular, but enough harder than Lafayette & Lincoln and Moosilauke that it keeps a lot of casual hikers away. Being known for “Worst Weather in the World” doesn’t help. And the hordes of tourist who ride up by car, van, and cog takes away from the experience. Tourist likly to account for a large portion of the Instrgram posts. Lafayette & Lincoln make up the most beautiful part of Franconia ridge. This hike is so popular I’ll probably will never hike it again on a weekend without starting before daybreak. Adams & Madison is the toughest in my book. Just as hard as Washington with no services on the summit. I’m sure that keeps the numbers down. Jefferson is awesome but its shorter and easier to get away with doing less trip planning. You can say the same for Eisenhower & Pierce, and Monroe. North and South Twin’s numbers surprise me. South Twin is spectacular, getting their is a decent length hike. So why the lack of trip planning? Any ideas? Most surprising of all, Carrigain. That’s a long hard hike, with fantastic views from Signal Ridge and the summit. It’s a lot longer than Jefferson, but it gets about the same amount of trip planning. That makes no sense to me. You got any ideas? The Carters have limited views and are one of the longer car rides from the population center (South NH, and Mass). Similar to the drive to Adams, but they can’t compete with the views. TrailsNH clusters trip planning information together for some of the mountains, because they are often hiked together. My view counts are from these clusters. This brings up an even more interesting question: How does Mt Monadnock (3165′) “the second most climbed mountain in the world” and Mt Major (1785′) another VERY popular local mountain, compare to Lafayette & Lincoln? I enjoyed your graph as well as your take on the numbers. It is amazing to think how much social media is driving these numbers. Instagram in particular.